The cheese was made with rice. We had mozzarella flavored rice cheese on hand so our sauce was more of an Italian sauce than the Cheddar version in the recipe. Our buttered bread crumbs were made with a potato starch bread, toasted and buttered and then sliced into cubes. This recipe took longer to do than we thought it would. Usually when we have macaroni, we’re eating almost as soon as the pasta is cooked. 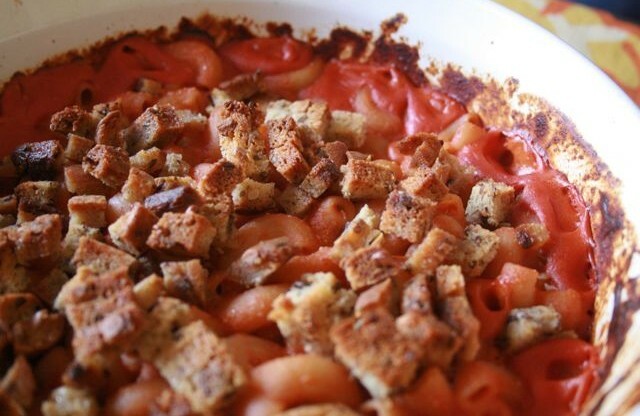 For this dish, you pour the sauce over the pasta and sprinkle the bread crumbs and bake it for a whole half hour. But that gave us time to do recipe number 2 — Pear and Grape Salad. This is a funny salad. When it’s finished it looks like you have a beautiful bunch of grapes on your plate. It’s a cold fruit salad in which the cream cheese acts like glue for the grape halves. 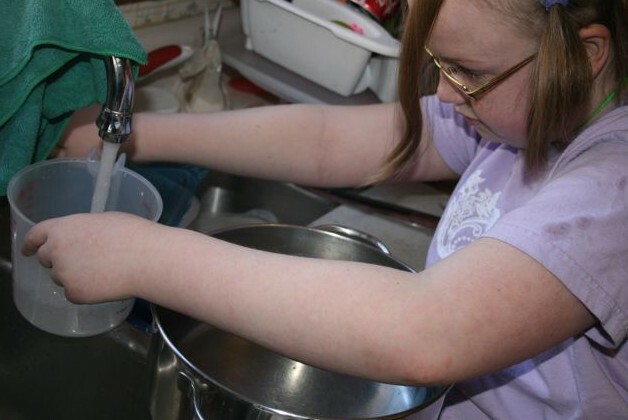 Mom had a serving, but we didn’t make one for little sister, she had the pears and grapes just mixed together — not as fun. Next time, we may use peanut butter or cool whip as the replacement. 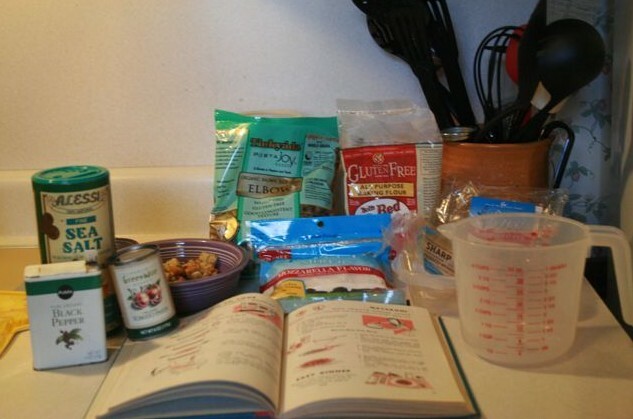 Below are the recipes we worked from. Use 2-quart uncovered baking dish. Cold or preheated oven at 350°. Baking time, 30 minutes. Cook macaroni as directed on page 40.
very low heat until cheese is melted. Place cooked and drained macaroni in baking dish. Pour soup mixture over the macaroni. Sprinkle buttered crumbs over top. Bake uncovered for 1/2 hour at 350°. Serves 4-6. For variation you can use 1 can cream of celery soup instead of the tomato. 2. Cut grapes in half, remove seeds. 3. Mix cream cheese with thick cream or mayonnaise. 4. Place pears cut-side down and spread cream cheese over them. 5. Cover entire surface of pears with grapes. 6. 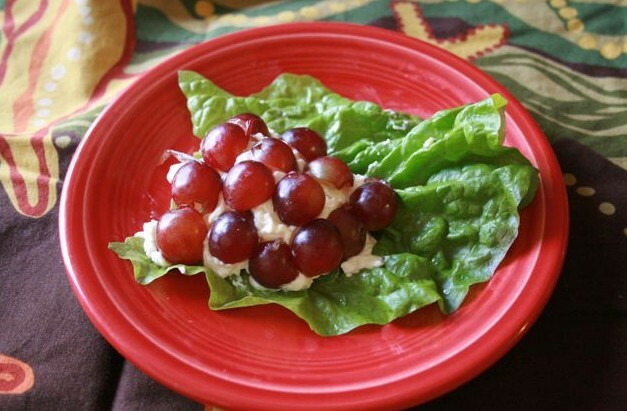 Place grape leaf on salad plate. Put pear, cut-side down on leaf. 7. The finished pear looks like a beautiful bunch of grapes. 8. Put mayonnaise on side of salad. Just to to clear. This is my idea BUT I got NO credit as the photographer!! Julia did an amazing job on this, the pear salad is a keeper, very yummy. The tomato casserole was missing something like meat and veggies, I am not a huge fan of tomato soup so that did not help in the yum factor. Look for a revised pale version as soon as we figure out how to make a dairy free cream of celery soup. And WE ARE STILL waiting on the Cranberry Crumble!! I think you should start with the desert next time. Good job Julia!!! Another sub for tomato sauce is to take a can of diced tomatoes and stick it in the food processor/blender. I will try the diced tomatoes next time I need tomato sauce. Thank you for saying it should be a GBR project. Thanks, Mrs. W. Maybe we can make it for you before you move away, but keep up with us here and we can share more recipes. Cool website. 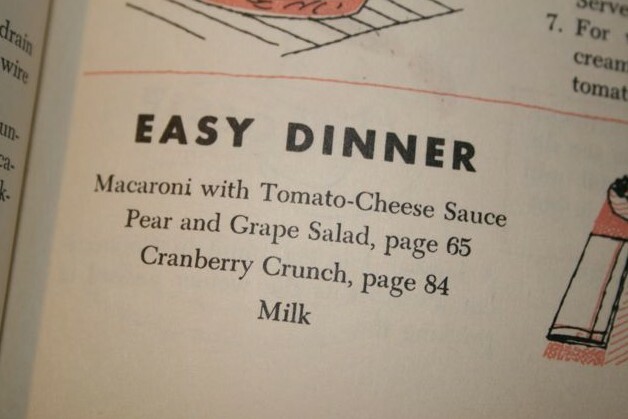 ur recipes sound good. Maybe i’ll try 1. i like the picture of u.Like the name 2. Love your website! Pictures are great and the recipes look yummy. Previous PostPrevious First Things, Second.